The XML Configuration Variables feature is one of the configuration features you can enable as you define the steps in your deployment process. This feature can be enabled for package deploy steps. Octopus will extract your package and parse your *.config files looking for any appSettings, connectionStrings, and applicationSettings elements where the name matches one of your variables. You can perform simple convention-based replacements in XML configuration files using this feature. We also have a feature tailored to JSON configuration files. If you are looking for something more flexible, we have the Substitute Variables in Files feature enabling you to perform complex transformations on any kind of file. 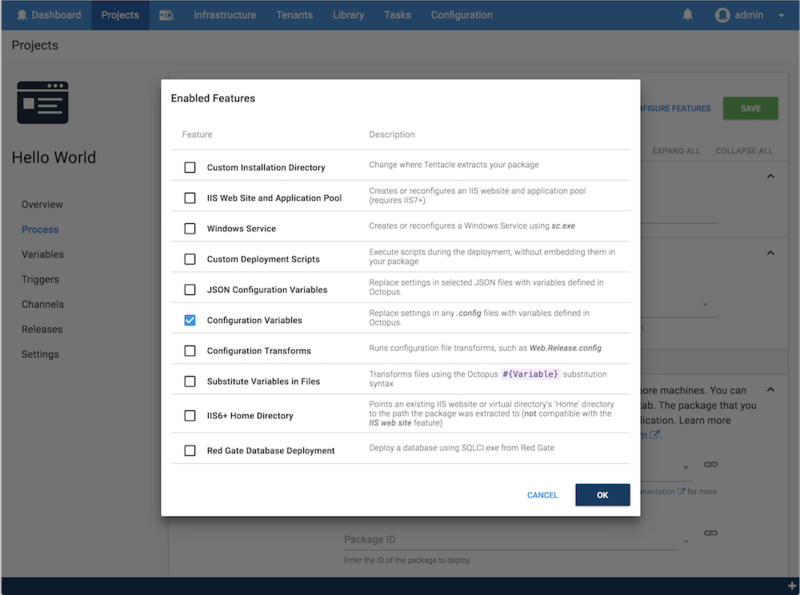 The following example shows you how to use the this feature to provide your application with different configuration settings for each different environment you're deploying to. In this example, we're deploying to a Test and Production environment. Enter a the name for the variable, for instance, AWSAccessKey. This name must match the key in your configuration file. Enter the value for the variable, for instance, ABCDEFG. Scope the variable to the environment, for instance, Test. Repeat the process for the Production environment, to give you a different value for the AWSAccessKey variable for each environment. Repeat this for each element you want to replace in your configuration file. Variables marked sensitive (AWSSecretKey in this example) are encrypted in the Octopus database. During deployment they are encrypted during transport, but eventually decrypted and written in clear-text to the configuration files so your application can use the value. Values are matched based on the key attribute for appSettings, and the name element for applicationSettings and connectionStrings. Learn how to do this with a fully worked example which describes how Octopus can take care of your deployment environments, without impacting how you configure your application for your local development environment. This example uses the XML Configuration Transforms feature and Substitute Variables in Files feature together.